I had a chance to talk with Benny Notheis at lunchtime today about the SAP Operational Intelligence product directions, and followed on to his session on a consolidated inbox that uses SAP’s Fiori user experience platform to provide access to SAP’s Business Suite workflow, BPM and Operational Process Intelligence work items, as well as work items from non-SAP workflow systems. SAP has offered a few different consolidated inboxes over the years — some prettier than others — but they all serve the same purpose: to make things easier for users by providing a single point of contact for all work items, and easier for IT by reducing maintenance and support. In the case of the Fiori My Inbox, it also provides a responsive interface across mobile and desktop devices. Just as the underlying database and transaction platform for SAP is converging on HANA, all user experience for applications and analytics is moving to Fiori. Fiori (and therefore the consolidated My Inbox) is not yet available on the cloud platform, but that’s in the works. As a consolidated work list manager, My Inbox provides multiple device support including mobile, managing work items from multiple systems in a single list and fully integrated into the Fiori launchpad. It has some nice features such as mass approvals, full-text searching, sorting and filtering, and sharing tasks via email and SAP JAM; work items can have attachments, comments and custom attributes that are exposed in the work list UI or by launching the UI specific to the work item. We saw a demo of My Inbox, with a user-configurable view that allows workers to create filtered lists within their inbox for specific task types or source systems in order to organize their work in the way that they want to view it. Work items can be viewed and managed in the work list view within Fiori, or the work item launched for full interaction using its native UI. Tasks can be forwarded to other users or suspended, as well as task type-specific actions such as approve and reject. Attachments can be added and viewed directly from the work list view, as well as direct links into other systems. The history for a work item is maintained directly in My Inbox for viewing by the user, although the underlying workflow systems are likely also maintaining their own separate history logs; this provides a more collaborative history by allowing users to add comments that become part of the My Inbox history. Emailing a task to a user sends a direct link to the task but does not interrogate or allocate access rights; I assume that this could mean that a task could sent to someone who does not have rights to open or edit the tasks, and the original sender would not be informed. Within any list view, a multi-select function can be used to select multiple items for approval; these all have to be approval-type items rather than notifications, so this might be most useful in a list view that is filtered for a single task type. There is no view of tasks that a user delegated or completed — a sort of Sent Items box — so a user can’t monitor the progress of something that they forward to someone else. Substitutions for out-of-office times are set in My Inbox, meaning that the user does not need to visit each of the underlying systems of record to set up substitution rules; these rules can be applied based on task groups, which are established by how task profiles are set up during the initial technical configuration. 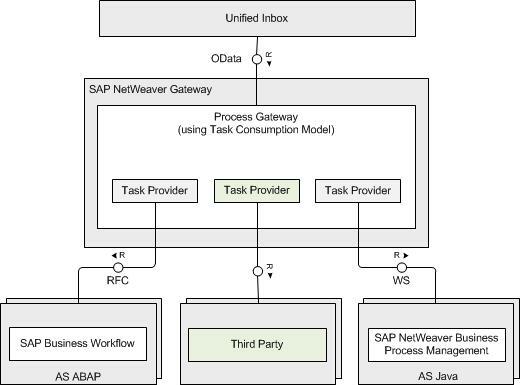 A good demonstration of the new generation of SAP user experience, and how Fiori can be used in a production transaction-oriented environment. There obviously needs to be a fair amount of cooperation between the Fiori-based My Inbox and the systems of record that contribute work items: My Inbox needs to be able to interrogate quite a bit of data from each work item, send actions, and manage user substitution rules via a common task consumption model that interacts with gateways to each type of underlying system. There is likely still quite a bit of work to do in those integration points to make this a fully-functional universal inbox, especially for systems of record that are more reluctant to yield their secrets to other systems; SAP has published specifications for building task gateways that could then be plugged into this model, which would expose work items from any system in My Inbox via a compatible gateway. The next good trick will be to have a consolidated history log, combining the logs from My Inbox with those in the systems of record to build a more complete history of a work item for reporting and decisioning.